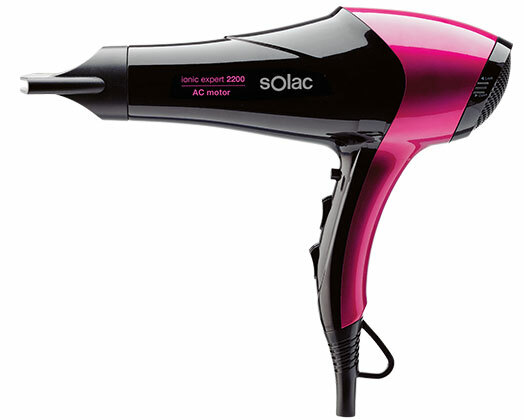 Home Products Solac Hair Dryer AC Motor Pink 3 Heat Settings 2200W "Ionic Expert 2200 AC"
Solac Hair Dryer AC Motor Pink 3 Heat Settings 2200W "Ionic Expert 2200 AC"
Solac presents the "Iconic Expert 2200 AC” hairdryer! This powerful hairdryer has a 2200W motor in-cased in a stunning futuristic black and pink body. Its compact body and ergonomic design allows it to fit comfortably in your hand and with its 2 speed settings and 3 temperature levels, the Iconic Expert is packed with all the functionality you need to have salon quality results!